From mid 2010 Character Options Postman Pat Special Delivery Service (SDS) figures were released single carded in a clear blister pack with a printed backing card. Figures already released include Postman Pat, Postman Pat (Pilot’s helmet), Ted Glen, Ben Taylor. These figures stand around 2.75″ tall and have articulation on the arms, legs and head. The earlier articulated Postman Pat figures of previous licencee Born to Play stand around 4″ high. 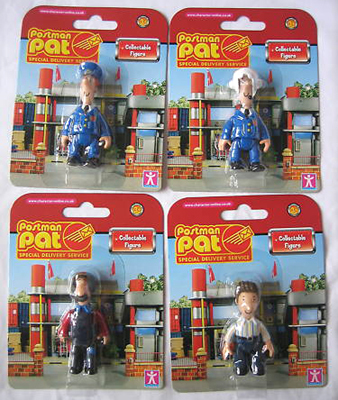 Note that on the single carded Postman Pat figures a new red SDS logo appears on Pat’s jacket.